Time is running out to get your NJAOH kilt in time for St. Patrick’s Day & Parade season. Show up at your next parade or function in a stylish NJAOH kilt. 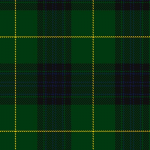 The kilts are made from a wool blend material and feature a green, black, and yellow tartan pattern. The cost is $125. Contact Pat Jockel at (732)279-6488 for ordering information.